The World #NoTobacco Day is an annual awareness day organized by the World Health Organization (WHO) on 31st May, aiming at highlighting the health risks of tobacco use and prompting governments to take actions against smoking. 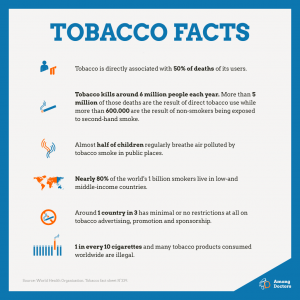 According to the WHO, while tobacco use kills nearly 6 million people each year, approximately 1 country in 3 has minimal or no restrictions at all on tobacco advertising, promotion and sponsorship. Over the last three years, the WHO has focused on the advertising ban, increased taxation and tackling the smuggling of tobacco products, all of which are actions based on evidence from epidemiological studies. This year, the World No Tobacco Day promotes the implementation of the standardized plain packaging of tobacco products. 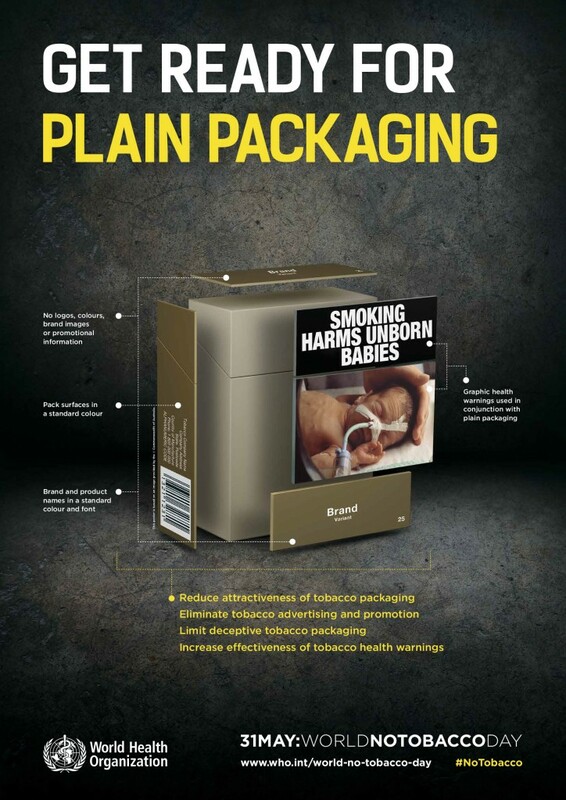 Plain packaging is a proven measure that tackles consumption by making tobacco products less attractive to consumers, curbing the use of promotional material on the package, limiting misleading design techniques suggesting that some products are less harmful than others, and increasing the effectiveness of health warnings. The package should bear only the name of the brand and product name in standardized characters and dark colors. The measure was first adopted in Australia in 2012, where early evidence suggests that it has begun to achieve its public health objectives. Since then plain packaging laws have been passed in France, Ireland and the United Kingdom, while several other countries are evaluating the implementation of such a measure. Join the AmongDoctors physicians-only professional network and discuss with us different topics on smoking cessation, public health policies and evidence on tobacco use! During the 69th World Health Assembly, the WHO announced the establishment of a new Health Emergencies Programme, which adds operational capabilities for outbreaks and humanitarian emergencies to complement the traditional technical and normative roles of the organisation. The programme aims at delivering support to contexts as they prepare for, face or recover from emergencies, whether disease outbreaks, natural or man-made disasters or conflicts. NCD Alliance and Bupa published a report on the potential of workplaces for the prevention and control of noncommunicable diseases (NCDs). The report, launched in Geneva, where the 69th World Health Assembly currently takes place, examines the evidence for the effectiveness of existing policy and regulatory measures, presents a set of recommendations, and calls upon governments, civil society and private sector to take shared responsibility for health and wellbeing through innovative partnerships, with a commitment to share expertise and knowledge, and mobilise resources. An annual antibiotic prescription rate of 506 per 1,000 population was estimated in the United States in 2010-2011 in a study published on JAMA. According to the authors, only 353 antibiotic prescriptions were likely appropriate, supporting the need for establishing a goal for outpatient antibiotic stewardship. Sinusitis, suppurative otitis media and pharyngitis were the diagnosis associated with the most antibiotic prescriptions. Only approximately half of the acute respiratory conditions were estimated to be appropriate for these conditions. A recently published article in BMJ estimates that medical error is the third biggest cause of death in the US, after heart disease and cancer. The authors mention that medical errors leading to patient death may be under-recognised in many countries, such as the UK and Canada, and call for a scientific approach and a revision of how national statistics are measured to enable a more appropriate recognition and a better understanding of the related deaths. A year after the World Health Assembly resolved to eliminate malaria from at least 35 countries by 2030, WHO is releasing a World Malaria Day report that shows this goal, although ambitious, is achievable. Since the year 2000, malaria mortality rates have declined by 60% globally. In the WHO African Region, malaria mortality rates fell by 66% among all age groups and by 71% among children under 5 years. But reaching the next level—elimination—will not be easy. Nearly half of the world’s population, 3.2 billion people, remain at risk of malaria. Last year alone, 214 million new cases of the disease were reported in 95 countries and more than 400 000 people died of malaria.